(1) It is dark, really dark. When I say it's dark, I mean it's dark. Within the first 15 minutes of the pilot we see a character brutally murdered by a demon sent by the devil. If you're like me and grew up watching Sabrina the Teenage Witch reruns every morning before school you will be a tad bit familiar with the storyline. However, this version of Sabrina is nothing like Melissa Joan Hart's in the best way possible -- there is no wisecracking, talking cat or sparks that come off of Sabrina's fingers as she casts a spell. (2) It references another Archie Comics' universe, Riverdale. In the first episode we hear a character ask, "So where do you go, Riverdale?" Greendale and Riverdale are said to border in this world. Roberto Aguirre-Sacasa, creator of both series, has shown interest in a possible crossover in the future. Even some of the Sabrina stars and Riverdale stars are on board for a crossover sometime soon. 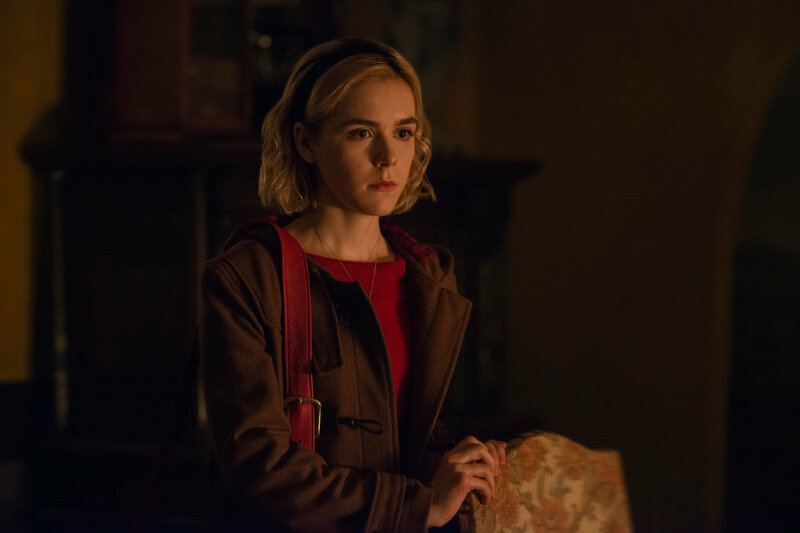 (3) Kiernan Shipka makes a great Sabrina Spellman. Kiernan Shipka isn't new to the acting world. She's mostly known for playing Sally Draper in the critically acclaimed drama, Mad Men. It was clear she could act then, but I was honestly stunned by her talent in the first episode of Sabrina, seeing her virtually cry on command in multiple scenes. (4) The special effects are amazing. From the spine-chilling scarecrow that chases Sabrina through a maze to the simplicity of the demons that give off an erie vibe, the special effects will certainly impress you and spook you at the same time. (5) The supporting characters are just as interesting as Sabrina. We’ve got the love-hate relationship between Aunt Hilda and Zelda, the struggles of the homebound Ambrose, the fears of lovestruck Harvey, and the troubles of Sabrina’s best friends Susie and Rosalind. The show does a great job at making you care as much about the secondary characters as you do about Sabrina. (6) It has a lot to say about female power. Sabrina being a young, female witch fighting the patriarchy is an ever-so-present theme in the first two episodes, with her not wanting to give up her birth name. She also uses some witchcraft to ward off the misogyny presented by some of her fellow classmates and even puts a spell on the principal to start the Women's Intersectional Cultural and Creative Association (WICCA). (7) It has a modern retro theme. Though there is no specific time period specified in the show, it has a '50s retro theme. With the vintage technology and designs in this show it feels like it is in the past, but when we see Harvey use a cellphone we realize the magic of this show is that we don’t need a set period. Overall, the show did a tremendous job at taking a well known story and adding its own dark twist. Now the question holds for the next season: will Sabrina be able to juggle the responsibilities of her mortal-witch life?